There’s hope for children in rural Sumatra. One of the three axis of the Tanoto Foundation’s poverty alleviation mission is education, and for the foundation, it means improving access to education at all levels, and ensuring quality education. This is by no means easy. The statistics are stark: only 60% of children living in rural Indonesia are enrolled in primary school compared to almost all children in more affluent urban areas. A study in 2010 by the Tanoto Foundation concluded that two thirds of the rural schools it surveyed were inadequate on so many fronts. Poor infrastructure and facilities, lack of hygiene and environmental awareness, lack of library and shortage of appropriate reading materials, and simply, poorly-trained teachers and teaching resources. In short, it would be impossible for the rural children to receive an education that would be comparable to that of their peers in the cities. To address these challenges, the Tanoto Foundation developed a holistic programme under the umbrella of the Pelita Pendidikan Programme. There are four thrusts: improve teaching quality, set up libraries and reading programmes, focus on improving school infrastructure, as well as provide early childhood education through its PAUD programmes. One of the more interesting initiatives to emerge from this development is the Principal Training programme. 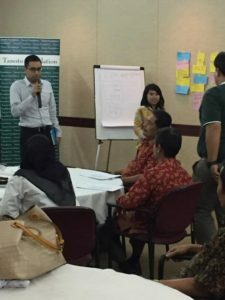 Collaborating with government, local districts, as well as academic and international agencies, the Principal Training Programme is currently implemented in over 200 schools where the Foundation operates in Riau, Jambi and North Sumatera. The goal of the programme is clear: to leverage on the educators and leadership of the schools in order to strengthen student learning outcomes. APC had the privilege of visiting Kerinci area in early December at the invitation of APC member Belinda Tanoto, and sat in on an actual Principal Training programme with some 24 principals or Kepala Sekolah as they are known in Indonesia. Sameer Sampat, the co-founder of the Indian School Leadership Institute (ISLI) and now CEO of the Global School Leaders, was there to meet with the principals as well and exchange ideas on principal training. ISLI works with school principals to improve outcomes in under-performing schools serving the urban poor. The session was focused on understanding and developing effective supervision of teachers, and introducing the idea of peer learning. It kicked off with reviewing previous trainings and goals that they wanted to achieve that day. Each of the three province trainers, Sasmoyo, Jepri and Fitri, former teachers themselves, led the sessions with zest. Their excitement was contagious, as the principals were enthusiastic and were clearly captivated, throwing out questions, sharing opinions and even challenging assumptions. The message was clear – when principals learn together, they can be peers and partners in improving teaching. In the dialogue that followed after the training, Sameer shared that the principals he worked with in India often cited three main challenges in their work life. He felt that it would be similar to what Indonesian principals faced – motivating teachers, performing administrative work as well as managing the parent stakeholders. The Indonesian principals agreed but also were quick to add that where they worked, they had to contend with poor infrastructure as well as low wages. One principal shared that their families have to supplement their household income with other activities in order to make ends meet. That night after dinner, we sat with the Ibu Margaretha Ari Widowati, Deputy Director of Tanoto Foundation, the trainers, Pelita Pendidikan Programme manager Rahmat Setiawan as well as the regional managers and field officers to hear their thoughts and feedback about the principal training programme. It was interesting to see that there were a lot of similarities in the curriculum but what stood out was the immense efforts and resources to support a rural education programme. Unlike ISLI, it was impossible for the trainers to visit their schools once a month. “Some of these schools could be as far as 8 hours journey away”, according to Fitri who manages 52 schools in Jambi. She is supported by 4 field officers whose work it is to identify and reach out to schools to partner with, arrange logistics as well as monitor the activities of the partner schools, all of which are linked through a combination of paved and dirt roads. A positive aspect of this programme is the existence of the Principal Working Group Forums (KKKS) which were created by the Ministry of Education in 1990s. While many of these groups are dormant, the Foundation was able to tap into these groups to introduce and implement their Principal Training programmes. The next day we visited two primary schools which participate in the Principal Training programme. SDN006 Sering Kec. Pelalawan, is in a small rural commune along the river bank and serves around 200 students. Students were having an exam that day, but we still saw a vibrant library which instituted a 15-minute reading programme before class. The school toilets and other infrastructure had been renovated under the Foundation’s improvement programme, and there was an active gardening project which was showcased to us. We were also told that since the river was so close to the school, it was prone to flooding. The second school we visited, SDN 004 Batu Agung was in the middle of the village centre and was larger – with close to 700 students. It was also an inclusive school and there were 22 special needs kids with disabilities ranging from learning challenges, Autism and ADHD, who were included in the classroom setting. At the request of the principal, all of the teachers have received some basic training in special needs education. When we arrived that day, the school was in the process of dismissal and children were in the midst of cleaning up the school before they left for the day. There was an active silent reading programme, which the librarian was proud to share that even parents and caretakers also participate in when they drop off the children. If we are to believe that education impacts the future of our nations, then one thing is evident: Tanoto Foundation is on the right track in transforming rural education. Through this and the many education programmes, they have impacted over 38,000 students and 4,400 teachers since they started work in 1981. In addition to Pelita Pendidikan, there are also scholarship programmes to support motivated youths from financially disadvantaged backgrounds to attend university or vocational programmes.